I finally got around to connecting a keyboard to my Nexus 7 tablet. This comes after spending the last week doing several Ubuntu installations that did not want to take on an old laptop. The ultimate goal was to have a faster way of typing than the touch screen on a tablet. I think it would be cleaner to just spring for a bluetooth keyboard rather than shoehorn a keyboard and mouse in through the USB port. Why the workaround? The laptop is old enough that it lags a bit even running Ubuntu. One grows accustomed to instant on and the speed of a tablet, and to some degree a Chromebook. There are some projects that I have been delaying for want of a keyboard, ones which require writing...such as blogging. Tapping out long text is tedious, and the voice to text feature doesn't work too well when you have other people talking nearby. I will keep the laptop for times when I know that I'll be sitting down to do work for several hours. 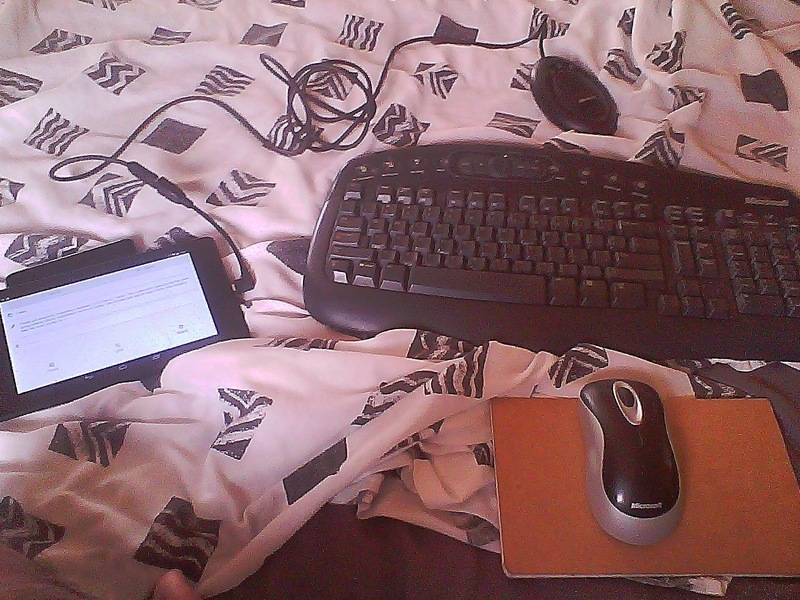 I'll have the keyboard and mouse on standby for instances when I want to type out something quickly. Now, it is time to work on a six year old computer that did not take a reinstall and is holding tons of photos and videos I did not back up. A new adventure.